I've listed some of our schedule at the end of this Q & A. To add a little extra to your own travel budget, I'll show you how to save premiums on silver and get your IRA storage free or at low cost. How does free storage for your IRA precious metals sound to you? There is no storage charge when you purchase a Perth Mint Certificate for gold or platinum in your IRA, or out of your IRA (silver does incur a .95% per year storage fee). Your holdings are fully insured by Lloyds of London and guaranteed by the Government of Western Australia. Best yet, your gold and platinum is stored free of charge in the Perth Mint, in Perth Australia. That gives you off shore diversification. It is fully sanctioned by the Internal Revenue Code for self-directed IRAs. Want another low cost choice? You will get economical storage when you open an IRA relationship with our online platform, ASI Precious Metals Direct, at www.ASIPMDirect.com. Storage is in New York or Salt Lake City. If you choose gold Eagles you can also store them overseas in Zurich. I can't help making the observation that regardless of storage costs, the absence of precious metals in your IRA can cost a lot in buying power when you retire. The dollar has lost 26% of its buying power over the last ten years. Gold and silver have preserved their buying power over that same period of time. Of course, all investments have costs attached. Wealth managers charge from 1-3% of money under management. Load funds have an upfront fee of 5% on average. There are various types of so called 'no load' funds, such as 12(b) funds, but they charge a back-end fee at sale and a 'marketing' fee, usually 1%, every year you own the fund. All this begins to look pretty bad when compared to relatively low storage fees of less than 1% in most cases or, better yet, free. Learn more about metals in your IRA. Silver rounds look like coins and contain 99.9% pure silver. They are issued by a private mint, not by a government mint. Silver rounds offer you the lowest premiums for small units of silver; currently, even lower than junk silver (also called 90% silver). At the time of this writing, the premium is $2.10 per ounce for silver rounds, as compared with $3.50 per ounce for junk silver. Call your ASI Preferred Client Relations representative for direct buying or visit www.ASIPMDirect.com for online purchasing of silver rounds and a wide variety of other precious metal products. In less than ten minutes, you can trade from your smart phone, computer or tablet. 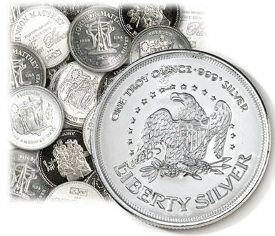 Over a dozen wholesalers bid for your business, and you automatically get the best prices for your silver rounds. Choose home delivery or storage onshore in New York City or Salt Lake City. I'm glad you asked. Our Michael and Rich are always ready to meet with you and any friends you care to introduce. Our biggest pleasure is to meet with you while traveling. Michael Checkan, Chairman, and Rich Checkan, President, will be in attendance at the Stanberry Society Event in Dallas, Texas on May 31st. You can still see the conference via live stream by signing up here. June 11th-20th Michael will be in Greece and Turkey with The Oxford Club for a Private Wealth Seminar. Be pampered in VIP style while meeting and learning from the best the financial industry has to offer... including, of course, Michael himself. Steve Emerick, our Manager, Preferred Client Relations, will be in Chicago from June 21st-24th, and he still has a few slots available for private meetings. Email Steve or call 877-340-0790 to set-up an appointment. Michael and Rich will attend the FreedomFest Conference July 9th- July 12th in Las Vegas. Let's meet and greet and eat! Send Michael or Rich an email requesting an appointment or give us a call to enjoy some quality time with them. Michael will move on from Las Vegas to the Sprott Natural Resource Symposium. He'll be in Vancouver from July 22-25th. Join Michael and attend this worthwhile conference. We are always happy to answer your questions. Send them to me at cweber@assetstrategies.com. Call for your guidance on silver rounds, IRA storage and to schedule a meeting, either via phone or in person, with our Preferred Client Relations representatives. We always look forward to your call and to helping you Keep What's Yours!